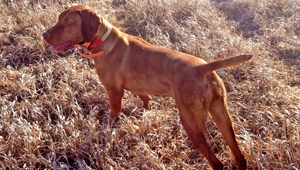 OUTDOORSMAN Vizslas is a small Utah vizsla breeder in Cache Valley Utah. 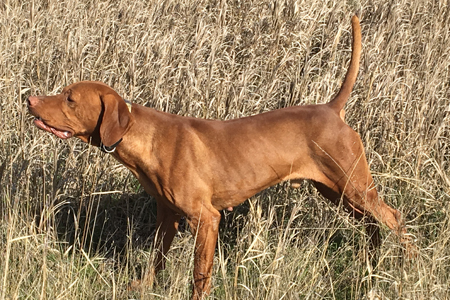 We focus on producing exceptional vizsla puppies with family friendly temperaments, loving and affectionate personalities, and strong desires to hunt hard. 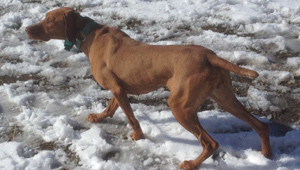 We typically have vizsla puppies for sale twice per year with our 2 litters. 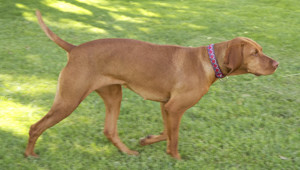 Our breeding program focuses on bettering the vizsla breed by only breeding dogs that exceed our strict standards for temperament, intelligence, obedience, health and prey drive. 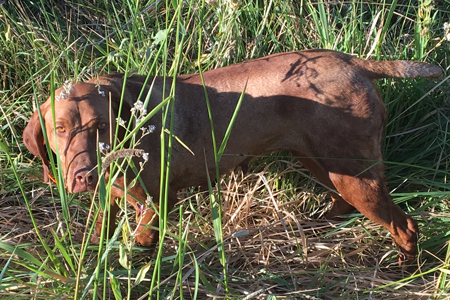 All of our dogs are professionally trained so that we can verify their maximum potential as hunters. We are obsessive hunters that demand that our dogs be the best out there. With that being said, our dogs are also family pets that have sweet and affectionate personalities. Our dogs come from some of the best lines out there. We are very particular about our dogs health and have no history of any kind of health problems and all puppies come with a 2 year health guarantee. 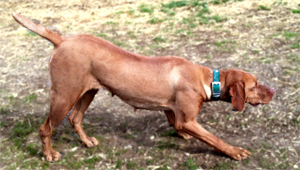 We also feel like our vizslas are some of the best looking vizslas around because of their muscular features and square blocky head structure. All OUTDOORSMAN Vizslas puppies go through a thorough socialization program called the “Super Dog Socialization Program”. We have found this socialization program to almost eliminate timidness and fear, build confidence, and better handle training pressure and loud noises. We have placed puppies all over North America from Alberta to New Mexico and from Connecticut to California. We try hard to accommodate everyone by allowing customers to meet the puppies at our home or over skype for those out of state. 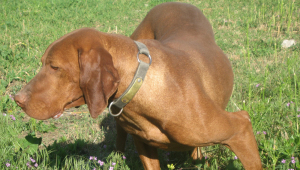 Nash is a beautiful male Vizsla that is our primary stud dog. He is a 58lbs hunting machine. He has excellent bloodlines with no history of hip, eye, or any kind of health problems. He is the most obedient dog that i have ever owned. His passion is to please. Diesel is one of the most beautiful vizslas I have ever seen. He is about 65 lbs and has beautiful blocky head. He has so much style. He hunts with his head and tail up. He has a great desire to hunt and find birds and with his nose he finds a lot of birds. Excellent field trial lines. Koda is an amazing hunter with tons of bird drive and an exceptional nose. She is about 50 lbs with a beautiful blocky head. 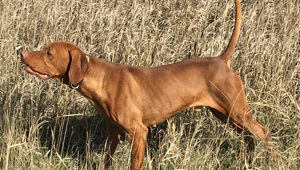 She comes from excellent field trial lines and her sire has enough field trial points to be inducted into the Vizsla Hall of Fame. Super sweet and loving. Penny is out of Nash and Koda. She is smaller than Koda weighing 48 lbs. She has tons of drive. She loves to run and play. She has a beautiful build that is blocky like Nash. She hunts hard and covers ground but has a very loving and affectionate temperament. Lacie is our newest addition. She is out of some fantastic field trial lines. She is smaller in size topping out at 40lbs. She is a very zippy vizsla. She is very agile and light and covers ground like crazy. She is a dog that can really hunt from dawn til dusk. Oakley is about 48lbs of solid muscle and a powerful set of wheels. She is a hard runner and covers a lot of ground. She will go all day in the field. She has a great nose and hard point. She is very sweet and very playful around the house. First off, I just wanted to say thank you for providing us with an amazing source of energy and fun. Kona has turned into an energetic and beautiful house dog. She has a two mile run every morning (rain or shine) and we have found that the run makes living in a house with a smallish yard tolerable for her. Everywhere we go, we get,”What a beautiful dog!” Seriously, nearly every trip to the dog park or even just out for a walk. Her temperament is incredible. She has never been aggressive toward anything. She has grown into an ebullient, silly and loving dog. Everyone she meets loves her. We are excited to announce the litter of Lacie and Diesel. Puppies were born mid October and will be ready for their new homes December 15th. These vizsla puppies have had their tails docked, dew claws removed and will have their first puppy shots. All the puppies are going to make amazing family pets as well as skilled pointers and hunting dogs. They come with a 2 year Health and Hip Guarantee. These puppies come from excellent field-trial and hunting bloodlines with over 60 championed dogs in their pedigrees. Both parents are great dogs with no health problems, fun loving personalities, and have an intense drive to hunt hard and please their hunting companions. Visit their individual page links below to see pics and descriptions of Penny and Diesel.